The knee is possibly the most commonly injured body part for football players. These injuries can range from mild knee sprains that don’t require the athlete to miss any time to the dreaded ACL tear, a season-ender. For this blog we’re going to stick with knee injuries that can be treated conservatively (without surgery); so, sprains of the knee ligaments will be the topic. If it is ever suspected that an athlete has suffered a more substantial injury such as a torn ligament or meniscus, an appointment should be made with either an Orthopaedic Surgeon or a Physical Therapist as soon as possible. Sprains happen when joints move too far in the wrong direction or with so much force that the tendons and/or ligaments are stretched beyond their normal capacity. When this happens the tissue of the tendon/ligament is damaged and possibly slightly torn. Healing times for these injuries can vary greatly depending on which structure is injured, the extent of the damage done, and whether or not the surrounding tissues are involved as well. However, there are a few rules of thumb than always help to minimize healing time as much as possible. 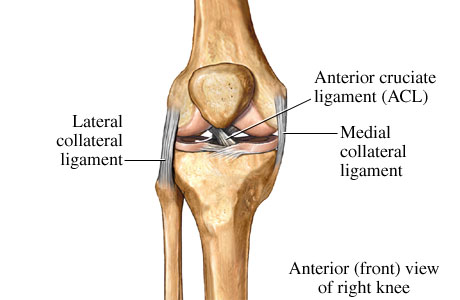 What is the initial treatment after a knee ligament sprain? As with any sprain, the initial treatment is focused on managing pain, reducing swelling, and allowing the tissue to heal. Pain can be managed through the use of ice packs, rest, and OTC (over-the-counter) medications. When choosing which OTC medication is best, it is recommended to avoid using NSAIDs (Non-Steroidal Anti Inflammatory Drugs) for the first 2-3 weeks following an injury. This is because some research suggests that NSAIDs may slow ligament and tendon healing rates in the subacute phase. The RICE pneumonic we described in the Ankle Sprain post last week is always helpful in reducing swelling. Additionally for knee sprains, I recommend performing an exercise called a Quad Set (video below). When the Quadriceps muscles contract, they act as a pump and can help remove fluid from the knee. What are the best exercises to restore mobility and stability after a knee ligament sprain? Once pain has reduced and swelling has subsided to an acceptable level, it’s time to start thinking about restoring ROM (Range of Motion), strength, and stability. With ROM you want to restore both flexion and extension, or bending and straightening. Heel Slides are a good exercise for restoring ROM. A tip I always give my patients is to not push their knee too far, but instead just far enough that they feel a light to moderate stretch. Strengthening for a knee sprain involves strengthening the muscles of both the knee and the hip. Straight Leg Raises (first video below) are one of my favorite early exercises following this type of injury. I like straight leg raises because A) they strengthen both the knee and the hip simultaneously, and B) they can be done in a variety of positions to strengthen different specific muscles. Finally, stabilization here refers to proprioception, or balance. Any exercise that requires balance on the injured leg can be effective here. In the second video below, we’re showing a Single-Leg Cone Tap. The emphasis here is on keeping your knee stable (not letting it bend), moving slowly and in a controlled manner, and obviously maintaining your balance.